Shop Candle Lanterns Direct and Save. Want to find Candle Lanterns that Look Incredible and Last Longer? Best Prices on an Elegant Contemporary Range of Multi Use Weatherproof Garden Lanterns. Long Lasting, Super Safe, Efficient Led Lanterns to Create a Warm Lighting atmosphere. All our Battery Lanterns have been specifically chosen to last a LONG time, in most cases they have timers which automatically turn the unit off after 6 hours. Our lanterns can last up to a month. Garden Lanterns Turn Your Garden on! Solar Lanterns are ideal for Outdoors, as they charge themselves via Solar Energy, there is no maintenance. They make the perfect Garden Lantern. Battery Powered Lanterns can also be used for Shaded areas Outdoors where Solar would be a challenge, and of course Indoors anywhere you Like, with easy change Batteries and up to 30 days before needing to change them. We have designs that suit every occasion. Spring is fast approaching, and you need outdoor and indoor lighting that illuminates this period. Suitable for parties and weddings as well, lanterns provide you with a cost-effective, and environment friendly way to use lighting any special area. How to Use Lanterns Indoors? Depending on the size and decorating theme you have used in your home, choose candle lanterns that complement the layout, furniture design as well as any other decorative accessories. 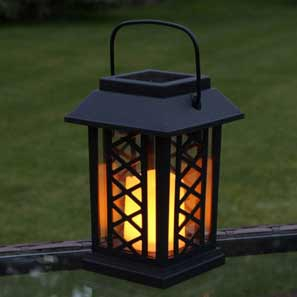 Different styles and colours of lanterns powered by Battery or Solar Power. Traditional / Modern and Oriental influences. The intricate designs ensure that our lanterns are as impressive in the day as they are at night time. Add a touch of Magic this Spring / Summer with the Elegant Charm of a Warm and Inviting Candle Lantern. Candle lanterns are very simple to use around the home – just pop a battery in and turn the light on, to create the best accessory for placing on your tabletops, mantels, and entrances. You can place an oversized lantern on a table and create a creative focal point. The other option is to display multiple candle lanterns if you are aiming for a more artistic and contemporary design. For a Christmas or holiday theme, group the lanterns in your entryway as it helps to establish a festive environment. Hanging Lanterns Outdoors can Provide a space with Luxurious feeling of Warmth and depth. The Lanterns come with Handles Hooks, Ideal for Trees or Pergolas. An excellent way of displaying your candles during the Christmas period is simply suspending them from the ceiling. You can use a sturdy ribbon, wire or a decorative chain. Lanterns also look great when hanging from a wall, so you can install some wall brackets to help support them on the walls. Ensure that you only hang the candle lanterns in areas where there is less foot traffic, like in room corners indoors or on the edge of the perimeter outdoors on your patio or yard. If you are looking for a creative way to enhance the area next to your entertainment centre during Christmas, or the area around a mantel, then candle lanterns offer an attractive solution. Since you can get these lanterns in a broad range of shapes and sizes, make sure you choose one that is proportionate to the area where you intend to place it in order to maintain functionality and usability of the space. Pair a small candle lantern with a larger one to add variety and depth. You can also match and mix metal lanterns with wood or Glass Style lanterns. These are only a few of the numerous ways you can incorporate candle lanterns, around your home or garden, to add a touch of magic to your decorations or simply enhance your living space. Contact us today for the latest high-quality candle lanterns specifically designed to suit a wide range of functional and decorative purposes whether for indoor or outdoor use.